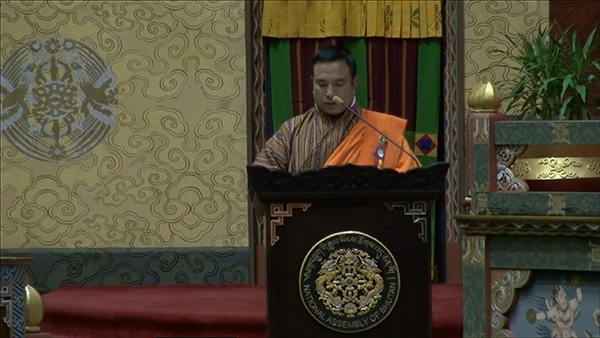 The economy’s fiscal deficit, which is total revenue minus expenditure increased by almost Nu 2B in the years 2015-16, according to the National Budget Report which the finance minister, Namgay Dorji presented at the National Assembly, today. Resource gap, which is total resource minus total budget outlay for the year, stood at around the same amount at Nu 4B. Fiscal deficit was at 3.2 percent of Gross Domestic Product. The report mentions that the government was committed to containing the deficit to 3 percent of GDP. According to the budget, fiscal deficit increased from Nu 2.8B to Nu 4.4B in the 2015-16 fiscal. However, in the following years, the deficit is expected to improve. The budget report mentions, it can be done through efficient expenditure management and resource mobilization strategy. The report also mentions that financing 85 percent of the total expenditure through domestic revenue would be challenging, with delay in commissioning of hydropower projects. Revenue growth may also be affected should Dungsam Cement Corporation continue to incur losses, as it would not be able to pay its taxes and dividends to the government. To finance this fiscal deficit, the report states, the government will continue to mobilise concessional loans from international financial institutions. The government would be borrowing from local banks and floating treasury bills to finance the resource gap. In fact it’s a big shock to people of Bhutan that Dungsam project is yet another failure of poor management and government policy. What was the government doing when they laid the project reports and survey. With huge deficit and business already running on zero profit with low production is a blow to our economy. We expect our policy maker and government to work into this issue and come up with solutions. Change the plans, production Status, energy management and auditing, detail progress and administration management meetings and infact kick out CEO who doesn’t give any solution and plans. Take initiative and look in the possibility of market, meet the market demands, meet with government of concerned clients, change policy of business and I guess we can save the project from sinking.